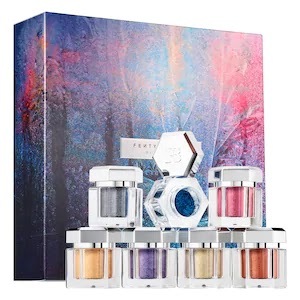 This holiday season Rihanna's seminal makeup line has taken everything a step further and made her line even more beautiful with this collection of beautiful bright eye pigments, highlighters and lip/eye crayons that will take you through the holidays and through winter in style. Sit back and look at everything you can get as a gift for someone else or yourself. A limited-edition palette of seven all-new, hyper-metallic Killawatt Foil Highlighters in a range of frost-inspired shades designed to make all skin tones pop. Who says fire and ice don’t mix? The Killawatt Foil Freestyle Highlighter Palette brings together seven all-new, never-before-seen, metallic highlighter shades. Get frosted in stone-cold lavenders and icy blues, or heat up in fiery coppers and tangerines. With intense, metallic edge, each rule-defying hue looks equally killer on all skin tones. Take a cue from Rihanna’s personal highlighting technique and rev up your glow with unexpected pops of chrome color. Rihanna’s no-limit approach to highlighting is all about layering luminizer to create colorful dimension from the cheeks to the eyes to the temples—blurring the line where your highlight begins and eyeshadow ends. Like the bestselling Killawatt you know and love, Killawatt Foil keeps skin lit beyond sundown with its weightless, long-wear formula—a cream-powder hybrid that instantly melts into skin and blends with almost zero effort. It’s also loaded with extra-fine, ultra-smooth shimmer to make all your hyper-metallic gleams come true. 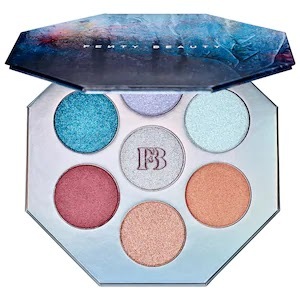 Killawatt Foil Freestyle Highlighters in Subzero (supercharged iridescent blue), Stone Cold (supercharged icy pink), Chillz (supercharged iridescent baby blue shimmer), Heart Burn (metallic plum shimmer), Coppin Ice (supercharged copper), Hunny Slope (metallic pumpkin shimmer), Scandal'ice (supercharged iridescent lilac shimmer). A limited-edition trio of creamy, metallic crayons for both eyes and lips—featuring complementary chrome shades in a portable, mirrored case for staying frosted on the fly. Deck out your inner ice queen. 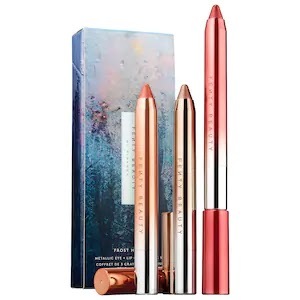 These Metallic Eye + Lip Crayon sets are all about staying frosty in more ways than one. Eyeliner or eyeshadow? Lip liner or lipstick? You call the shots with these multi-talented crayons, which come in a trio of complementary shades designed for everyone. Live the gleam in Frost Bunny’s soft neutrals, Frost Hunny’s fiery pops, and Frost Money’s chilling bolds (each set sold separately). With insane glide, this metallic formula is creamy upon application, yet made to set-and-forget. So whether you want to line lids, smoke them out, or glaze your lips in vivid chrome effects, these metallic crayons are down for it all. Each portable pack of shades is complete with a hidden mirror for frost-worthy looks on the fly. A limited-edition trio of creamy, metallic lipsticks with a fresh, frosted finish designed for all skin tones. Frosted lips get fresher than ever with limited-edition Snow Daze and Snow Nights. 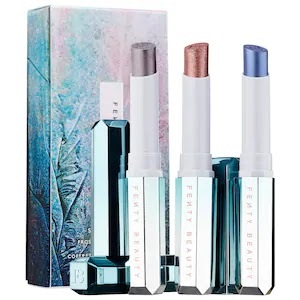 Like no metallic lipstick you’ve ever experienced, these frosted lip trios are made to flatter all skin tones with gleaming, hyper-vivid impact. Forget everything you think you know about frosted lips. Snow Daze and Snow Nights feature an unbelievably creamy formula backed by extra fine, pearlized pigments that slips smoothly and evenly in crisp, metallic color. What you get is a sophisticated sheen—think lustrous dimension that anyone can pull off. Bring the heat in sassy, warm hues with Snow Daze, or chill out in dramatic, cool tones with Snow Nights. Each portable pack of shades is complete with a hidden mirror for frost-worthy lips on the fly. A limited-edition mega set of do-it-all, loose, metallic pigments for eyes, cheeks, and lips—featuring seven high-impact shades in a melt-worthy range of jewel tones. Brace yourself for the ultimate chill: The Avalanche All-Over Metallic Powder Set brings a flurry of frosted looks to your eyes, cheeks, and lips like never before. These high-impact metallic pigments are designed to coat all skin tones in rich, blendable color for the ultimate range of frosted effects that anyone can pull off. Nothing’s off limits for these luminous loose powders, thanks to a light-as-air formula of mega-fine pigments born for layering. With a melt-worthy texture as smooth as fresh snow, Avalanche is perfect for applying vivid dimension to just about anywhere. Use it as eyeshadow, cheekbone highlight, blush, or dab it over lipstick for instant gleam. Delivered in a decadent, reusable, collectors’ box, each shade is individually packaged in mini, travel-friendly jars for true no-limit luminosity that goes where you go. Loose Pigments in February (metallic violet), Cleopatra (metallic green-gold), Foxy (metallic terracotta), Raspberry Rave (metallic berry), Brain Freeze (metallic gunmetal), Ice Cream (metallic gold), Glacier Gang (metallic blue). All of these pieces can be purchased at www.sephora.com or SEPHORA stores now until supplies are gone. These is a limited-edition collection.